These words flash onto the screen during the trailer for U23D, which promotes itself as the first live action digital 3D film. But U23D is not the first to claim that one can possess knowledge by visualizing the world in three dimensions. At the turn of the twentieth century, stereograph companies such as Underwood and Underwood proclaimed that “To see is to know.” I just finished up a project about stereographs as a means of virtual travel in the early 20th century, so I rushed out to experience a twenty-first century 3D technology. Stereographs are images that are taken from a slightly different perspective and then mounted side by side; when you look at a stereograph through a viewing apparatus called a stereoscope, you can see a single 3D image (think View Master). Although I had naively assumed that the push to use images for education didn’t really begin until the TV Age, Judith Babbitts argues that stereograph companies “played a dominant role in creating the popular discourse that redefined what was important to know and how one should go about knowing it. As no knowledge industry had done before it, the stereograph industry identified technology–the technology of the camera–as the essential factor in acquiring information” (127). Both Underwood and its competitor Keystone View Company enlisted educational experts such as the former president of Harvard to testify to the importance of “eye-work” and the ways that the realism of stereography enhanced learning. Not coincidentally, both companies sold stereograph sets to schools and provided detailed guides for teachers and students. These guides reflected the prejudices and ideologies of the time; for instance, Visual Education Through Stereographs and Lantern Slides: School Work (1917) advanced a virulent “racial geography” that characterized whites as the “great race,” blacks as the “least progressive” (31). In the late 1930s, the Department of Education estimated 2/3 of all public schools used stereographs; of course, by then, stereographs were being supplanted by movies as the leading mass media. 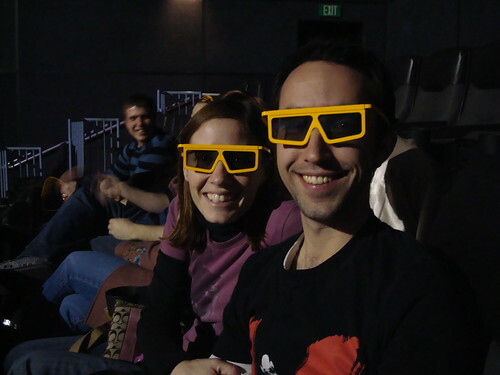 What can we learn from looking at early 20th century 3D media? Perhaps most importantly, the example of the stereograph reinforces the need for media literacy. Even we get immersed in the wonders of 3D, we need to maintain a critical distance and exercise judgment, to understand how 3D images are constructed and for what purposes. Flash forward a century to U23D. What grabbed me was not so much the sense that the experience was real, but the stunning visual effects. For instance, I was dazzled watching Bono “painting” the air with light and thrilled as I flew in on Larry Mullen Jr. banging his drums. The film stirred up my emotions more than the typical concert video, since I felt like I was more a part of the crowd (the crowd in the film, not the popcorn munchers in the theater) when the hands of ecstastic concert-goers popped up right in front of my face, and I felt more connected to the band when Bono reached out his hand and it was right there for me to grab. Still, viewing the film was a pretty passive experience when compared to actually being at a U2 concert, since it engaged just my eyes and ears, not the rest of my body. Although I was in the iMax theater with a hundred or so other people, it wasn’t the same kind of social scene as a “real” concert is. I would have felt like a loser among the reclining theatergoers if I hollered and cheered at the end of each song, or stood up and danced, or reached out for Bono’s proffered hand. You can only give yourself over to the illusion so much. So I felt both drawn in and out of it, amazed but not awed. Perhaps I would have been less detached if the social conventions of the theater were different, if I were able to stand up and dance. Certainly the medium has the power to transport you, and I can see potential educational applications (if the technology were cheaper), such as virtual tours of historic sites, training in physical skills (surgery in 3D? ), etc. I certainly embrace U23D’s message of love, respect for human rights, activism, and rock ‘n roll (and U2 cool), but Triumph of the Will in 3D, say, would be pretty scary. It’s important that even as we immerse ourselves in the visions made possible by technology, we also take off the dorky-cool stereo glasses and see with clear eyes. Babbitts, Judith. “Stereographs and the Construction of a Visual Culture in the United States.” Memory Bytes: History, Technology, and Digital Culture. Ed. Lauren Rabinovitz & Abraham Geil. Duke University Press, 2004. 126-149. Lions and tigers and screens, oh my! When is something that you watch on a screen more “real” and more compelling than what you experience right in front of you? When you’re watching live footage of birds wheeling around a cliff rather than standing in front of a zoo cage glancing at listless black bears. In “Zoo Keepers’ Dilemma,” a short piece produced by WNYC’s Radio Lab, former zoo director David Hancocks says that his ideal zoo is a “cyberzoo,” where people would watch live, high-definition images from the wild rather than view animals in unnatural environments. According to Hancocks, most zoos focus more on entertaining people than on serving the needs of animals or advancing understanding of nature. The idea of the cyberzoo originated at a cocktail party thrown by wildlife filmmaker Chris Parsons, who set up 3 jumbo screens like a bay window and piped in live footage of sea birds at the Orkney Islands. Enraptured, party-goers stared silently at the “window on a natural scene” for half an hour. Since the footage was live, Parsons theorized, people were curious about what would happen next. Parsons later established Wildwalk, a wildlife exhibition in Bristol that incorporated footage from nature films as well as walk-through rainforest-like environments. Unfortunately, Wildwalk closed, but the idea is an intriguing one–create immersive, interactive environments where people can come together to see how animals behave in the wild. By the way, check out Radio Lab, a show that explores “one big idea,” typically related to science. The show brilliantly weaves together interviews with scientists, witty conversations between hosts Jad Abumrad and Robert Krulwich, and exquisitely produced sound effects. My favorite episodes include Emergence, Musical Language and Detective Stories.